From Yellowstone we made the short trip down to the Grand Tetons. We had become used to seeing plumes of smoke rising in the distance in Yellowstone, but as soon as we left it was apparent that we had left the thermal world behind. 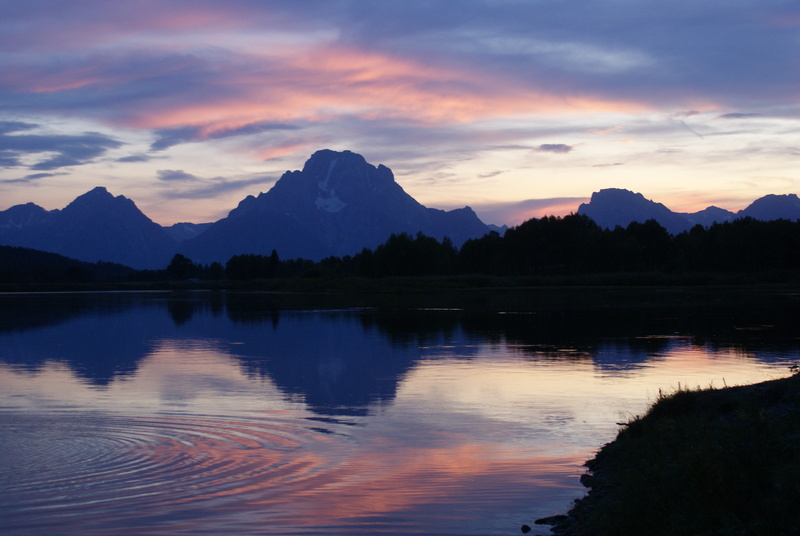 Grand Tetons offered something “more traditional” in the way of national parks – mountains, lakes, rivers, and lots of wildlife as well. 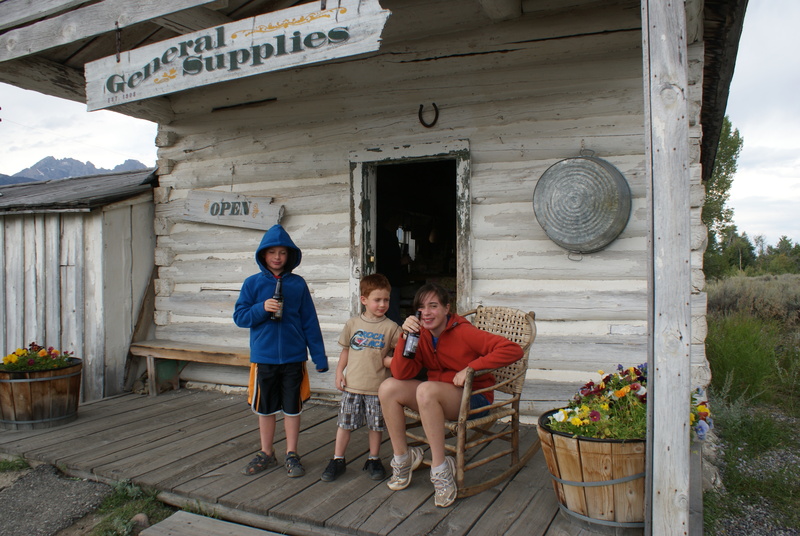 Our first stop was at Colter Bay – we stayed in a typical National Parks cabin right near Jackson Lake. This is a great place for easy hiking and we took a hike for a few hours near the lake around huge waterlogged meadows. 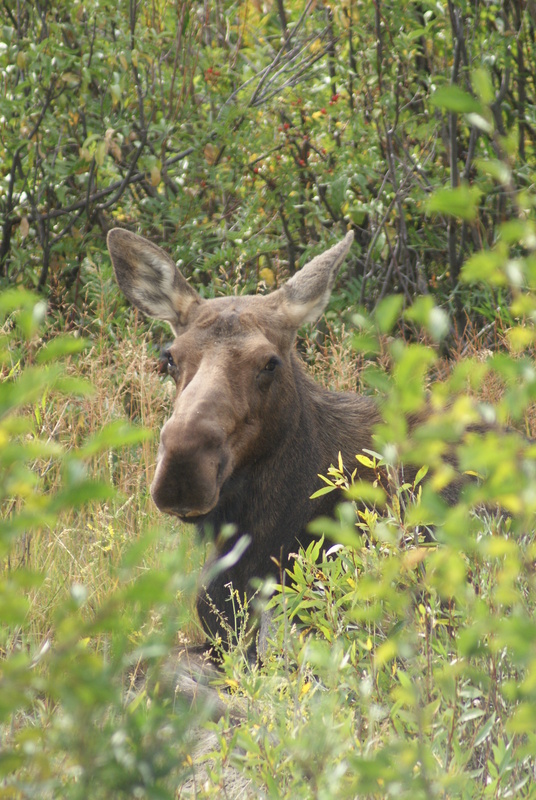 Our main wildlife objective was to see moose, and we saw our first moose quite early on. Grand Teton is relatively small and easy to get about. We spent a sunset at the famous Oxbow Bend, and witnessed one of the most spectacular sunsets we have ever seen anywhere. We popped in to the Jackson Lake Lodge where the kids swam in the pool, and we took the ferry across Jenny Lake and hiked up to Inspiration Point – us, and hundreds of others. One of our favorite stops was at Manors Ferry ( the Park HQ), where the historic district has old houses and vehicles and best of all, an old style candy store, where the kids were excited to buy and taste Sassafras candy – known to us only through Hannah Montana on TV. We saw the best wildlife over here, including moose (from really close up) and lots of bison. Grand Teton is a great park for families – you can find everything in a small package – some nice hiking, incredible mountains, lakes …you name it. It lacks the big name appeal of Yellowstone perhaps, but it is so close that it would be crazy to miss it out. We loved our time there. Heading out of the park, we spent a night at Jackson Hole, a big resort town. We liked it – a great Western atmosphere, and the kids enjoyed the shoot-out, which takes place nightly throughout summer. The following day, we turned westwards and northwards, and began the long, two-day trip back to Vancouver. Driving through Wyoming and Montana was great – it’s big country and I’d love to explore it more some time. We also stopped in at pretty Coeur d’Alene, Idaho. Another place that looks like it would be worth a day or two. PS: These days I plan great rips for families to destinations worldwide. Click here for more details.